1. Mix together the Honteri, soy sauce, ginger and sugar, stirring until the sugar dissolves. Put the salmon in a shallow dish, pour over the honteri mixture, cover and leave to marinate in a cool place for 1 hour. 2. Heat a heavy non-stick frying pan and lightly grease with 1tsp groundnut oil. Lift the salmon from the marinade, add to the pan and cook for about 5 minutes, turning the fillets over once. 3. Meanwhile, stir-fry the vegetables. Heat 2tbsp groundnut oil in a wok, add the broccoli, celery, red pepper and pak choi and stir-fry over a high heat for 3 minutes. 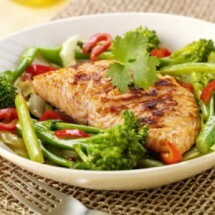 Pour in any marinade left in the salmon dish and stir-fry for a further 1 minute. 4. When the salmon is cooked, lift the fillets from the pan and keep warm. Add the fish stock and let it bubble for 1 minute, scraping the pan to incorporate any juices sticking to it. 5. Serve the salmon with the vegetables and the pan juices drizzled over.